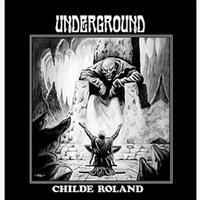 Childe Roland’s music sits in the territory of psychedelic music, but also garage band sounds and David Bowie type glam. There are sections that come close to progressive rock and some things that feel rather like Hawkwind. It’s very British and very tasty. This is a cool album and I like it a lot. There is a great psychedelic rock element to this, but it also feels a bit like Hawkwind. It’s a cool tune. Even more psychedelic, this is another tasty number. It’s got some of that Hawkwind element on display, too. This one is almost progressive rock in nature. More dramatic, this is very much a progressive rock like song. There is still some psychedelia on display, but overall I’d consider this prog. It’s quite British, quite pretty, but also rather dark. There are a lot of symphonic overtones to be heard here. Mix David Bowie, Hawkwind and Spinal Tap to create this cool tune. The Bowie element (particularly like the glam era) is particularly relevant. Harder rocking, that Bowie sound is all over this one. It’s a cool number that’s a bit of a change of pace. There’s a killer instrumental section later with a lot of tasty guitar soloing. With female vocals, this is a melodic rocker with a killer guitar solo sound. It’s less psychedelic than some of the other stuff, feeling more like a mainstream rock ballad. A bouncy rocker, this one has a great garage band kind of sound. There’s more of that psychedelic texture back, but with a hard rocking, rather distorted sound. Rather David Bowie-like, this is a hard-rocking, garage band sort of song. It’s got some psychedelia in it and other elements, too. Here’s one that’s got more progressive rock built into it, but is also very much about hard rocking David Bowie type psychedelia. It’s another strong tune, and another that brings variety to the table. As the title suggests, this is tied to the earlier piece from earlier. It continues those musical themes. There are some especially tasty musical elements here. And here, Roland continues the concept of another earlier placed tune. This is quite proggy and has some jazz elements. It’s a cool tune. Here is a progressive rock meets psychedelia inspired piece. It’s quite tasty and there’s some tasty keyboard work.